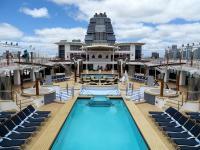 Sudprom.Ru / Bolidt hits all-time high as cruise refits surge. Главная Новости Bolidt hits all-time high as cruise refits surge. Bolidt hits all-time high as cruise refits surge. The vibrant cruise ship refurbishment market is reflected in an all-time high in refit work for Bolidt Synthetic Products & Systems, with the record including completion of five major ship projects so far this year. Bookings for a further seven large ship jobs are part of a workload that the company says includes ‘dozens’ of forthcoming projects planned for well into 2019. Источник: Bolidt Marketing & Communications department.